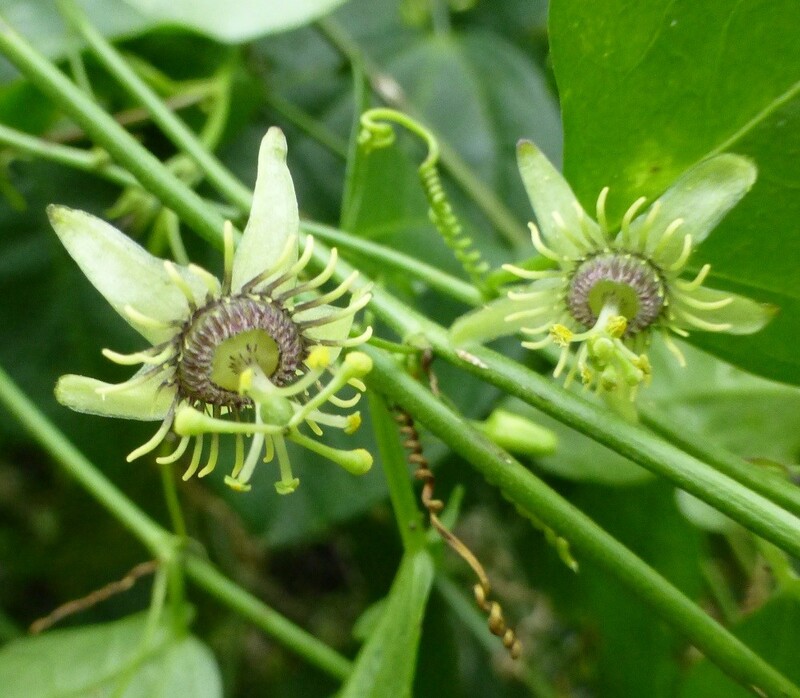 Corkystem passionflower, Passiflora suberosa, is a passion vine native to Florida. Some of its other common names are Devil’s pumpkin and Indigo berry. It is native to Florida, Texas, the Caribbean, Mexico and South America where it grows in the shade of hammocks and shell middens. It is not salt tolerant and will not grow where it is exposed to salt water, however it may tolerate a slight amount of salt air. I recently discovered some beautiful specimens growing on a salt marsh island so I am reconsidering their lack of salt tolerance. See the last photo in this article. I believe they are, (or at least the specimens I have located) actually salt tolerant. This is the only passion vine that I have found to attract zebra longwing butterflies. 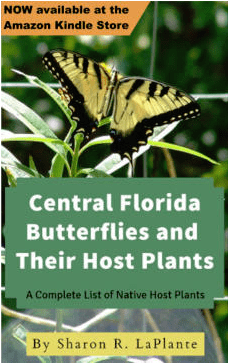 It is a must have for any butterfly gardener. Zebra longwing butterflies and this passion vine both prefer shady spots. Zebra longwings do not like direct sun because they are almost completely black and they absorb a lot of heat so tend to stay in areas that are shady. 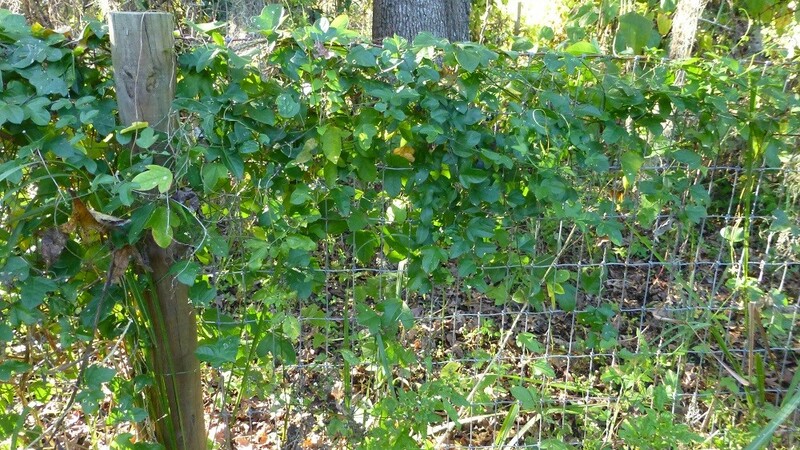 This vine also attracts the gulf fritillary butterfly, in central Florida, and the Julia, in south Florida. It just seems to always be preferred by the zebra longwings in my gardens. However, gulf fritillaries will certainly use is at a larval source if there are no other passion vines around. It is a perennial vine and will climb just about anything you place it near … small shrubs, a trellis and will also create a ground cover by spreading out, whichever vines don’t go up … will go out. One can certainly trim and train to their liking. However if you plant it as a butterfly larval food take care and don’t trim off the tender new growth, at the vine tips, because this is where the butterflies will lay their eggs. It prefers part shade and once established it is virtually maintenance free. 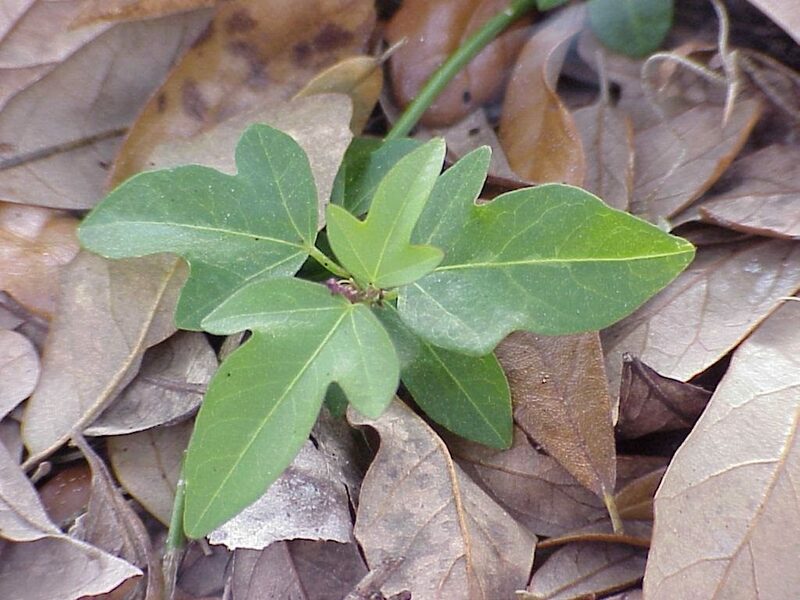 The leaves are entire to three lobed, but can vary greatly from region to region. They are generally 1 1/2 inch to 4 inches in length. The stem becomes woody and winged with maturity. The flower petals, or actually the sepals, are a yellowish green and inconspicuous, however insects use them as a nectar source and the zebra longwing butterfly will collect pollen from them as well. 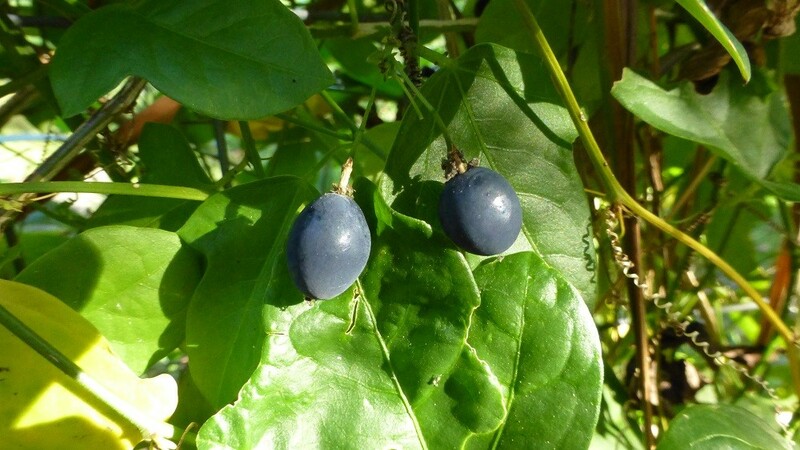 The fruit is small, egg shaped, and turns from green to a dark purple once ripe. If you are collecting seeds you should wait until they are a dark purple in order to insure that the seeds are viable. Processing seeds is messy because the purple fruit will stain, however stains on ones hands washes away after only a few washes. My preferred method for saving the seeds is to squeeze the interior pulp, and seeds, from the outer skin, into a bowl of water and let it ferment for no more than a week. Once the pulp and seeds have fermented I put them into a fine mesh strainer and rinse the entire mass under running water, squishing the pulp through the mesh, and them spread the remaining seeds out on paper towels to dry before storing. It can quickly fill a flower bed so it is best planted by itself or in an area where one won’t mind it becoming a ground cover or rambling over nearby plants. My largest plant rambles over an area of bamboo and is about ten feet wide and about that high. Once the plant becomes established and starts flowering, and setting fruit, you will most likely never need to buy another one because there will be plenty of seedlings in and around the parent plant. Propagation is achieved by transplanting seedlings, sprouting seeds and rooting cuttings. 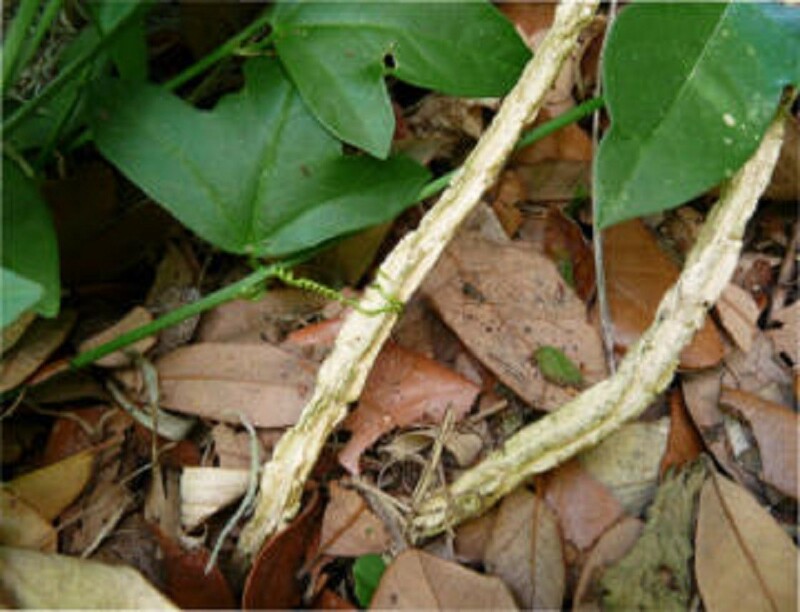 This species does not move itself by rhizomes as the maypop and purple passion vine do. 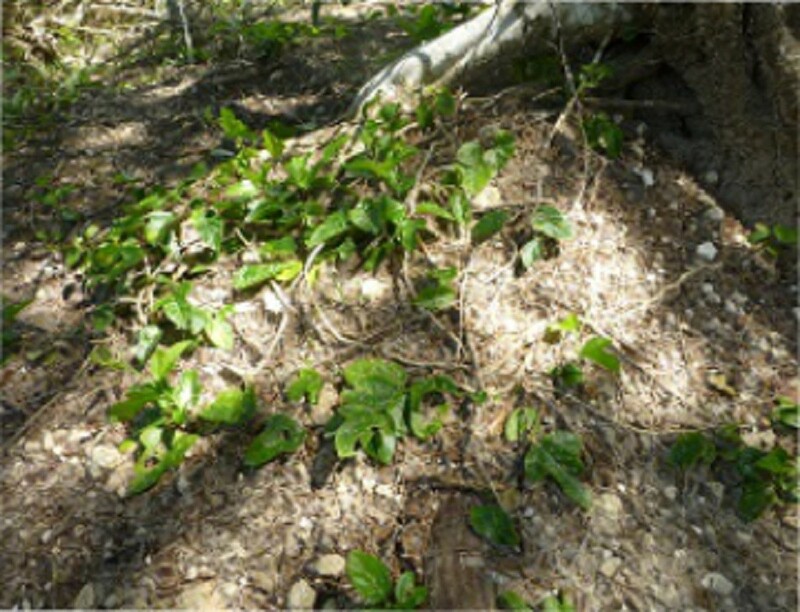 However it does produce lots of seedlings around the parent plant where its fruit drops to the ground, and underneath trees where birds perch and leave their droppings. If seedlings sprout underneath trees I generally allow them to stay there and climb the tree. Many I transplant to other areas of my property to ensure the butterflies a constant source of larval food. When starting seeds it is best to soak them in warm water over night. Do not plant them too deeply and be sure to keep them warm and moist. Some literature states that they need light for germination. However, one should have good luck as long as they are not planted deeply enough to rot. If sprouting in the cooler months use a heating pad underneath and plastic wrap on top to keep in the warmth and moisture. I actually use a large plastic container with a clear lid to keep them warm and moist and bring it inside to a warm part of the house. Do not let the seeds dry out … frequent mistings of water will help. Also, do not plant the seeds too deeply. My rule of thumb is to plant them pretty shallow with just a light sprinkling of soil on top. Many people have great success with sprouting them in between sheets of damp paper towels and then putting them in soil. As the plant grows older the lower stems will form a corky, looking, outer covering, hence the name … corkystem passionflower. If you love butterfly gardening plant some corkystem passionflower and the butterflies will find it. In my garden the zebra longwings flutter around by the dozens between their passion vine and the many firebushes and lantanas I have planted. Buy corkystem passionflower seeds here! Buy corkystem passionflower starter plants here!